Located in the heart of the downtown, the hotel is the centerpiece of Appleton's financial and entertainment district. Only minutes from the airport and walking distance to over 30 unique bars and restaurants, the Radisson Paper Valley Hotel provides big city service and amenities in a small town environment. Vince Lombardi's Steakhouse: Contains over 300 pieces of rare and one of a kind memorabilia from the estate of football legend Vince Lombardi. The Orchard Restaurant: Pergolas creates an open-air outdoor Tuscan setting. Award winning brunch served on Sun. 9:30-1:30pm. Clubhouse - A Pub of Sports: Sports bar with 8x11 split screen video wall and 14 additional TVs. Sandwiches & appetizers. 23 different beers on tap. Jo ala Mode: Casual atmosphere serving Starbucks coffee and Ice Cream treats. Also a wide variety of pastries and sandwiches. Intermezzo: Tropical themed lounge specializing in Tropical blended drinks, appetizers, sandwiches and other midnight snacks. 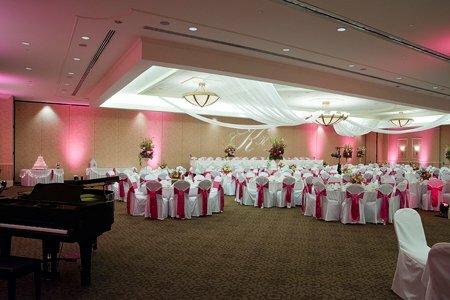 Grand Ballroom: Hotel has 28 meeting rooms totaling 40,000 square feet. The largest meeting room is 13,950 square feet. Barlow PlanetariumWorld class planetarium; adults - 5.00 USD, Seniors and children under 12 - 3.00 USD.